DigitalHealth.London Accelerator programme is uniquely positioned to provide in-depth knowledge of the NHS to a cohort of high potential small and medium sized businesses (SMEs). The Accelerator aims to speed up the adoption of innovation at scale, ensuring that greater numbers of patients benefit from emerging new technology, more rapidly. It’s the first programme of its kind, based in London, which draws upon a number of key founding and strategic partners, who together bring a rich and diverse collateral of resources and expertise across healthcare, research, innovation, digital health and tech. The programme is receiving £1.7 million of funding from the European Regional Development Fund (ERDF) as part of the European Structural and Investment Funds Growth Programme 2014-2020. The Department for Communities and Local Government is the Managing Authority for ERDF. Established by the European Union ERDF funds help local areas stimulate their economic development by investing in projects which will support innovation, businesses, create jobs and local community regenerations. For more information visit https://www.gov.uk/european-growth-funding. Each SME is assigned a Digital Health (NHS) Navigator, an experienced professional from the NHS with the expertise to understand their needs and gain first-hand advice on products in development and business models. 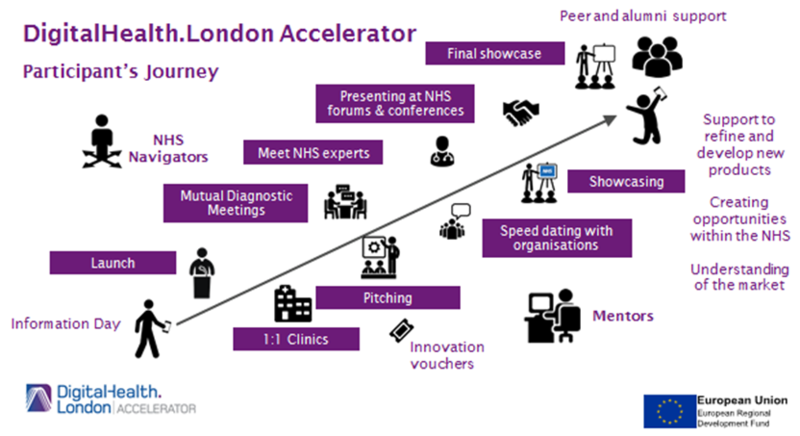 What can you expect from the DigitalHealth.London Accelerator programme? Throughout the programme, the cohort of SMEs will be encouraged to attend (by “invitation-only”) highly informative events to build up their knowledge and network in the NHS to tackle the challenges when scaling up their business with the NHS and the wider healthcare system. Get in touch with us at dhla@digitalhealth.london if you would like to take part in the programme. We want to help you demonstrate the great potential of your innovations and support your development in order to bring high potential products to market. We want to help connect you with solutions to some of the challenges that our health and care system is facing, and support you to make the most of those solutions and technologies. Our Accelerator has been specifically designed to complement more general business accelerator and incubation programmes. Businesses should participate in the Accelerator to explore the healthcare-specific attributes of their business or products. The DigitalHealth.London Accelerator is part-funded by the European Regional Development Fund as part of the European Structural and Investment Funds Growth Programme 2014-2020.